The Online Assessment Center was developed in partnership with and as the founding sponsor, PwC. The Council for Economic Education is a leading designer of high-quality resources facilitating instruction and assessment. The Online Assessment Center (OAC), builds further upon this record providing a free service where teachers can securely administer assessments, gain real-time data, and measure student knowledge and understanding of economic and personal finance concepts. In four easy steps teachers can use this service to analyze the efficacy of their instruction and modify their approach. Access the entirety of CEE’s library of Economics and Personal Finance assessments at the Upper Elementary, Middle School, High School and University levels. Register today and create your free Online Assessment Center account. Existing users click here. The Online Assessment Center is now home to the National Economics Challenge practice tests. With these tests, teachers can see if their teams have what it takes to compete in the Challenge. Visit the National Economics Challenge website for more information about the Challenge and how to register a team. 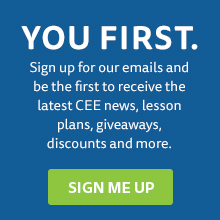 The Online Assessment Center offers up the entirety of CEE’s assessment library to teachers. Assessments in Economics and Personal Finance at the Upper Elementary, Middle School, High School and University levels are available. The Online Assessment Center also features financial literacy assessments tied to PwC’s Earn Your FutureTM curricula. With a stated commitment to helping enhance the financial capability of youth and promote prosperity, PwC launched Earn Your FutureTM, a $160 million, multi-year investment centered on two goals: helping students develop critical financial skills and providing educators with the resources and training to teach those skills. PwC’s Earn Your FutureTM curricula are composed of easy-to-follow lesson plans accompanied by interactive handouts. The curricula is free and available to download for easy access to financial literacy education. There are 30 financial literacy modules spanning grades 3 through 12 and that cover Saving & Investing, Career Exploration, and Planning & Money Management topics. Find out how your students measure up in just four steps! For more information about the Online Assessment Center please email info@councilforeconed.org. Results of individual assessments and student identity will be available to individual teachers. At no time will students be identifiable to anyone other than their teacher. Anonymous results of individual assessments may be combined with those of others for the purposes of research about effectiveness of overall programs. In doing so, state, school, teacher or class results will not be identified.